Join us in July for the 3rd annual Angry Owl Ultramarathons! Connect with other Angry Owl runners on Facebook. WHAT: 24, 12, or 6 hour runs over a flat one mile loop. Think of an elementary school jog-a-thon for grown ups (snacks included). 24 hour run begins at noon on Saturday and concludes at noon on Sunday. 12 hour run has two start times: noon on Saturday or midnight Sunday. 6 hour run has two start times: noon on Saturday or 6:00 am on Sunday. WHERE: Bush's Pasture Park, Salem, Oregon. 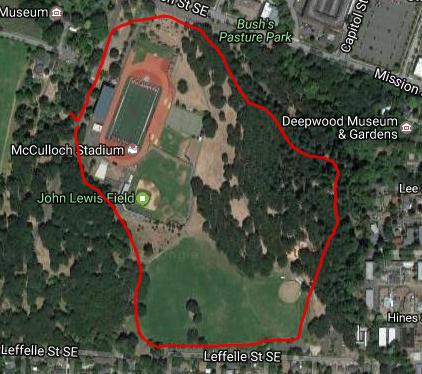 We will be on the southeast end of the park by the Phillips Softball Field off of Leffelle St SE and Yew St SE. This address will get you to the parking lot: 1050 Leffelle St SE, Salem, OR 97302. COURSE: The loop is about a mile long and has a combination of hard packed dirt, well-maintained non-technical trail, grass, packed gravel, and a bit of asphalt. See course map here, and here is the Strava segment. Official results will count each loop as exactly one mile. If your GPS says that you ran further, then you ran further, but our results will show one mile per loop. TIMING: Race will be chipped timed by the expert timers at Race Northwest. AID STATION: We will have a single aid station near the Start/Finish area stocked with water, Tailwind Nutrition Endurance Fuel, Gu Labs energy gels, fruits, salty snacks, sweet snacks, and some other goodies. You are welcome to leave some of your own foods near the finish line for easy access as you're running. In order to reduce waste, we will not be providing any cups. Bring your own bottle(s) or cup(s). They can be kept at the aid station if you'd like. RUNNERS SETTING UP CAMP: Our start/finish location is right next to a small parking lot, so your vehicle will be accessible during the race. Runners are welcome to bring their camp chairs and coolers to the event and set them up near the start/finish area as long as they are not impeding the runners or other park-goers. Do be aware that this is public park, and that event organizers and volunteers will not be watching your belongings or be liable for anything that is lost, broken, or stolen. Runners and crew may not camp at the park on Friday night before the race. SPECTATORS: The park is open to the public during our event, and spectators are more than welcome to come out and support. Family and friends may join runners for a lap or two throughout the event, but please do not plan on running all day with your spectator. PACERS: Please do not plan on using a pacer. A friend or family member may join you for a lap or two when needed, but no formal pacers are permitted. WEATHER: Be prepared for hot weather, but this is the northwest so you ought to be prepared for cold rain as well. LIGHTS: There's a 100% chance that it'll get dark at night. We'll light the aid station area, but runners are responsible for lighting up their run with a headlamp, handheld light, or both. CAPS: Each runner will receive a Lost in the Sauce cap from our friends at Alpine Dam when they check in. Additional hats may be available for purchase after the race. WHAT’S WITH THE NAME? Owls at Salem's Bush's Pasture Park gained national attention by attacking a few runners and taking a few hats. Don't worry, nobody was seriously hurt, and the attacks are rare. It became a fun talking point when MSNBC Reporter Rachel Maddow held a competition to design a sign warning park goers of the owl. Now, the signs are posted and locals and internet observers alike have had fun with the image and have even given the owl a name! 2017 RACE RECAP: Read Rachel Entrekin's recap of the 12 hour run ﻿﻿here﻿﻿. 2018 RACE RECAPS: Read Stacy McGraw's recap of the 12 hour run here and Craig Simmons' recap of the 24 hour run here.